Bosses at a theme park have been ordered to change the appearance of their top attraction after complaints from local residents. Planning officers at Ryedale Council say Flamingo Land must remove the red and white cladding and bright red light from its Cliff Hanger ride. 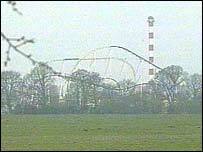 The multi-million pound ride opened in March 2002 to a surge of complaints from residents and councillors. They branded the 55 metres tall structure an "eyesore" and councillors served the park with an enforcement action to make changes. Despite an appeal from Flamingo Land the planning inspectorate upheld the council's action. Park owner Gordon Gibb was dismayed by the decision, and said it meant the tower would now take on the appearance of an "industrial oil rig structure". He told BBC Look North: "I can definitely understand the concerns in principle to a 55-metre tower in the middle of a green belt area." "But having been accepted by the council... I find the detail of colour and material employed to be somewhat pedantic." In addition to removing the cladding and red light, bosses must paint the tower light grey. 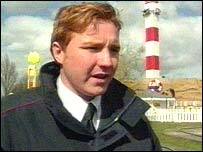 In his report, planning inspector Paul Morris said the tower looked "completely out of place". He went on to describe it as "obtrusive" in views from the surrounding area and out of character with the rural landscape.